As one of the newest models in the Mercedes-AMG lineup, the CLA45 AMG has a lot to live up to. Fortunately for Mercedes-AMG, the performance-oriented sedan has been up-to-task with that, as it has established itself as a worthy competitor to more established rivals like the BMW M3 and the Audi S3. 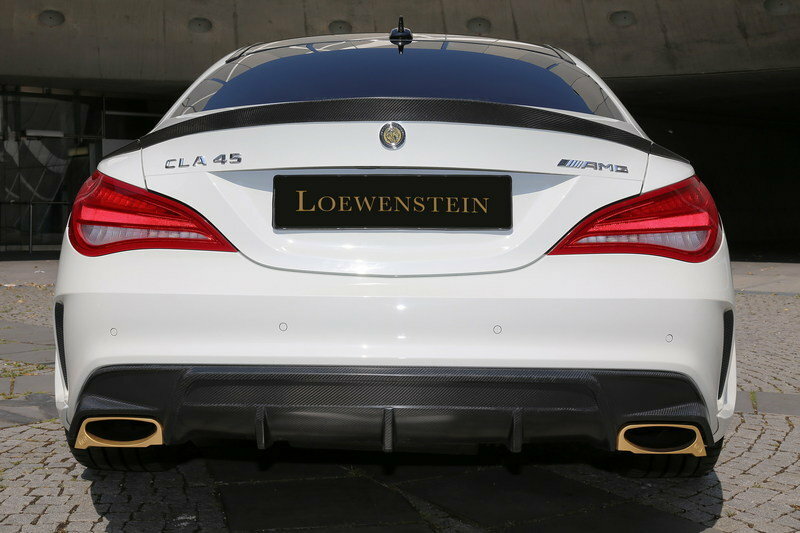 Owners of the CLA45 AMG have very little to worry about the car, and now, they have even more reasons to celebrate now that Loewenstein has introduced its first tuning kit for the sedan. 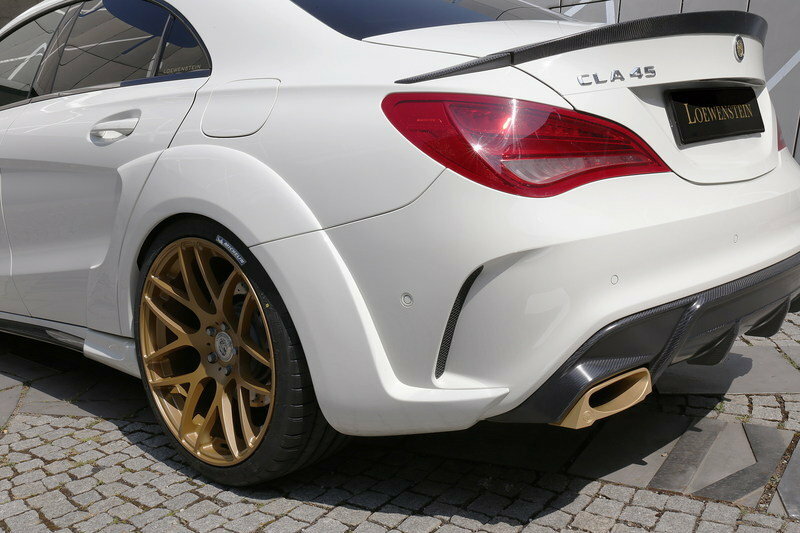 In line with its past works, the German tuner focused its attention on giving the CLA45 AMG improved performance capabilities. That’s the focus of the program, although a new wide body aero kit, a new set of wheels, and a carbon fiber-dressed interior are also part of the checklist. Overall, its a relatively comprehensive kit that touches on a lot of important aspects of the CLA45 AMG. There are no suspension modifications and that’s a little bit disappointing. But, given the variety of options it had on how best to approach the CLA45 AMG, I’d say that Loewenstein did a really good job at improving as much as it could on the car without disregarding its “AMG-ness”. Loewenstein didn’t offer any pricing information about the program so prospective customers are advised to contact the tuner directly to get a quote on the tuning kit. 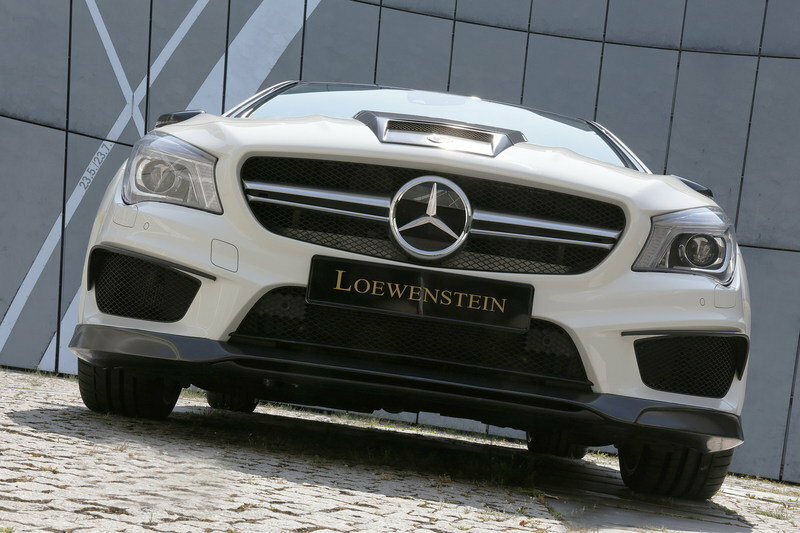 Continue reading to learn more about the Mercedes-Benz CLA45 AMG By Loewenstein. The Mercedes CLA45 AMG’s already boasts a sporty look that underscores its performance credentials. But, Loewenstein still took it upon itself to install a wide body kit that further emphasizes the four-door coupe’s dynamic aesthetic. The wide body kit is made from a light carbon fiber compound and features a front spoiler, a three-piece trunk spoiler, and a rear spoiler. All together, the aero kit adds 0.8 inches on the width of the front axle and 1.6 inches on the rear axle. Lowenstein made no mention of this in its press release, but photos of the CLA45 AMG clearly shows a vented hood with an integrated induction air-intake to give the predominantly white sedan a nice black contrast. Finishing off the exterior upgrades is a new set of 20-inch concave wheels that Lowenstein developed for the program. The wheels are shod in slip-proof Michelin Pilot Super Sport tires measuring 245/35 ZR20 at the front and 285/30 at the back. 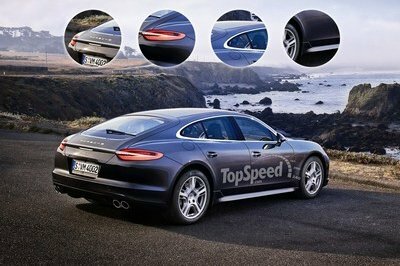 As an added option, the German tuner is also offering a set of 20-inch wheels with the Rennsport wheel design. Loewenstein gave the CLA45 AMG’s interior a pretty impressive aftermarket package, highlighted by carbon fiber accents on the steering wheel, door decorative strips, and dashboard appliances. The middle console also received the carbon fiber trim. Rounding out the modest upgrades to the cabin are car mats and soft velour protectors in the baggage compartment. These upgrades aren’t mind-blowing by any stretch, but they are effective in giving the cabin a more luxurious feel to it. the engine produces a peak output of 425 horsepower and 399 pound-feet of torque. 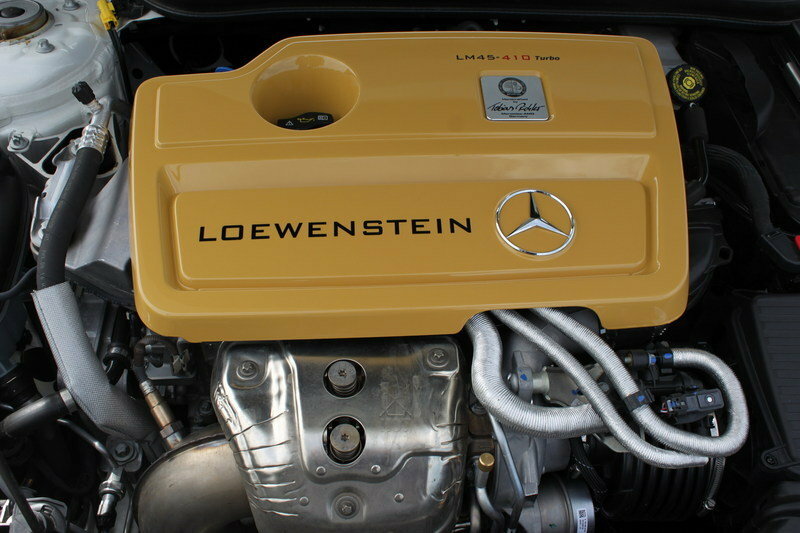 Loewenstein wasn’t too ambitious with its engine program for the CLA45 AMG, opting instead to adopt a more realistic plug & play system that puts enough extra horses to make the four-door coupe’s 2.0-liter turbocharged four-cylinder engine stand out. The tuner-developed module comes with a digital processor that extracts as much as 410 horsepower and 391 pound-feet of torque. That’s an impressive jump from the four-door coupe’s standard output of 360 horsepower and 332 pound-feet of torque. If 410 ponies isn’t enough, the German tuner is also offering a new downpipe with a sport catalytic converter, which works in concert with the aforementioned induction air-intake to help the engine produce a peak output of 425 horsepower and 399 pound-feet of torque. Performance numbers weren’t released, but it’s safe to assume that the CLA45 AMG would be able to sprint from 0 to 60 mph in the south side of four seconds and hit a top speed in the neighborhood of 180 mph. Pricing details about the program won’t be publicly announced, so customers who are interested in getting the program are advised to contact Loewenstein to obtain pricing quotes. A quick trip to the company’s website, www.loewenstein-manufaktur.de or www.cla-saphir.loewenstein-manufaktur.de ought to do the trick. That, or customers can directly email the aftermarket tuner at info@loewenstein-manufaktur.de. It’s no secret that the Mercedes CLA45 AMG was put in this world to compete against the standard-bearer of its segment, the BMW M3. While that’s a task that’s far easier said than done, it doesn’t help the CLA45 AMG’s cause that the M3 has been the beneficiary of some impressive aftermarket programs in the past. Back in October 2014, American tuner MORR Wheels was instructed by Speed District founder Josh Shokri to come up with a wheels and performance program for his M3. On that note, MORR Wheels went and built an impressive kit that touched on the aesthetic and performance fronts of the M3 sedan. For starters, the sedan was given a Yas Marina Blue paint finish. It also received a carbon fiber interior trim and a new set of 20-inch, ten-spoke MonoForged VS52 Competition wheels. These wheels were part of MORR Wheels’ Competition Series, an exclusive set of wheels that weighed in at just 20 pounds per piece. MORR Wheels finished off its program for Shokri’s M3 by installing a beta tuning power upgrade that improved the output from the M3’s 3.0-liter, inline-six engine to a tidy 580 horsepower and 625 pound-feet of torque, significantly more than the standard output of 425 horsepower and 406 pound-feet of torque. If the Mercedes CLA45 AMG isn’t staring down the BMW M3, there’s a good chance that it’s doing the same to the Audi S3 Sedan, the other direct rival of the AMG-fied Merc in this segment. That’s a good thing because the S3 Sedan was also the recipient of an aftermarket program, which in this instance came from ABT Sportsline. The German tuner’s kit for the S3 Sedan was also launched in 2014. 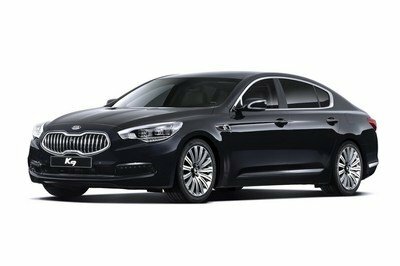 It combined healthy doses of aerodynamic and performance upgrades to help unleash the sports saloon’s full potential. ABT Sportsline installed and/or added fender inserts, integrated entrance lights, floor mats, and air caps into the S3 Sedan. New wheels were also offered, but the biggest ingredient of the kit was the tuner’s “New Generation" uprating system that came with its own control unit. 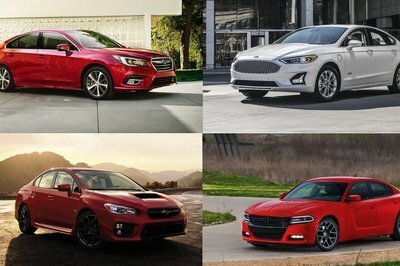 With all the aftermarket mechanical in place, ABT Sportsline was able to increase the S3 sedan’s output from its standard 296 horsepower and 280 pound-feet of torque all the way up to 370 horsepower and 339 pound-feet of torque. It’s not enough to beat out what Loeweinstein was able to accomplish with its own kit for the CLA45 AMG, but it’s pretty darn close. 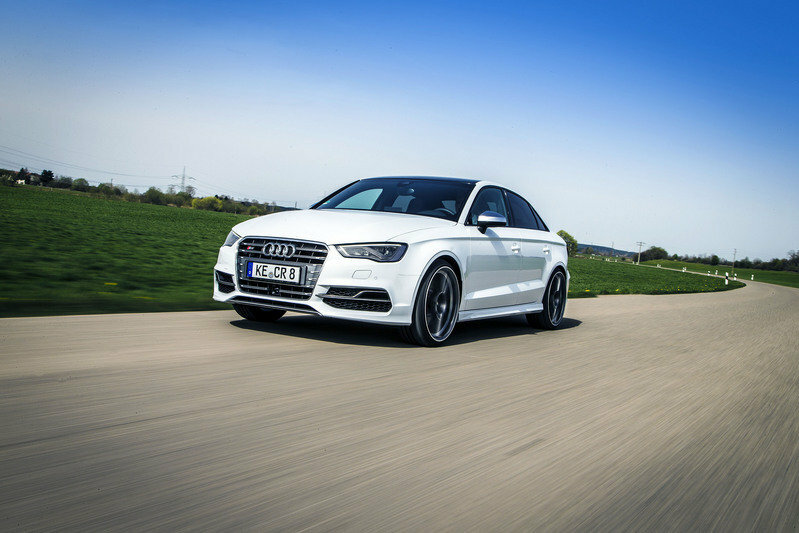 That power increase on the S3 Sedan was certainly reflected in the car’s performance numbers. 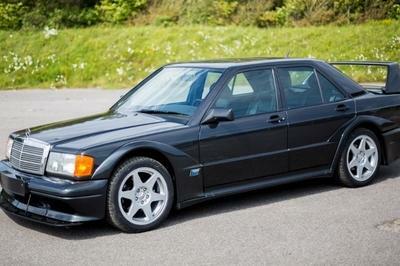 For instance, its 0-to-62-mph sprint time fell to 4.5 seconds, four-tenths quicker than the standard S3. 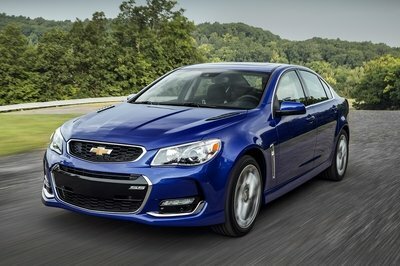 Likewise, the sedan’s top speed also went up to 165 mph. Loewenstein’s program isn’t going to make the CLA45 AMG a world beater, but it doesn’t have to given the obvious limitations it has as a model that sits in the lower rungs of Mercedes’ model hierarchy. For the most part, it’s a program that gives the CLA45 AMG an extra kick that should come in handy anytime the car is in the mood to flex its AMG muscles. Having 425 horsepower, instead of the standard 360 ponies, under that hood goes a long way in accomplishing that.